EFFECTIVE IMMEDIATELY: Applications for transfers and new Business Tax Receipts will only be processed in our Main Office at 400 South Street, 6TH Floor, Titusville. However, you may renew your Business Tax Receipt or drop your application off at any of our branch office locations. Per Florida Statute 205.194, a copy of your Professional License is required before your Brevard County Business Tax Receipt can be renewed. You will need to bring your professional license with you to renew or include a copy if mailing your renewal in. Also, we no longer issue hang tags for businesses such as Lawn Care, Landscaping, Tree Services, etc. Your Business Tax Receipt is sufficient. Local Business Tax Receipts are required for most businesses and are issued by counties and cities. Per County Ordinance 102-28: The county hereby levies a business tax for the privilege of engaging in or managing any business, business location, profession or occupation within the county authorized pursuant to F.S. ch. 205. Per the Ordinance, other department’s approval is required before the Brevard County Business Tax Receipt can be issued. A business located in an unincorporated area of the county may need Zoning Use Permit, Building Occupancy Review and/or Environmental Health Septic review. If your business is located within an incorporated municipality (city limits), a City Business Tax Receipt must be procured before a Brevard County Business Tax Receipt can be issued. Requirements for a business located within a municipality, contact the City. If the business name on the Business Tax Receipt is anything other than the legal name of the owner(s), it must be registered or re-registered as a fictitious name with Florida Division of Corporations. Division of Corporations can be reached at 850-245-6058 or www.sunbiz.org. To qualify for a Business Tax Receipt, you must furnish the following information depending on where the business is located. Listed below are the three types of Business Tax Receipt applications. Please download the application that is applicable to your business. In order to download an application, you will need Adobe Reader installed on your PC. You may also apply for your business tax receipt online. During the online application process, you will need to download the completed application packet below, save it to your desktop and then upload it during the online application process or email it to: bustax@brevardtc.com. If you have already obtained a Business Tax Receipt, an application should be completed within 30 days for any change to the current account you have on file. A change in the account could be location, ownership, mailing address only, name change, or addition/deletion to nature of business being conducted. Modify business tax receipt online. A Business Tax Receipt may be transferred upon application and fee. Prerequisites for new location must be satisfied (i.e. State License, Building Occupancy, Zoning, City Receipt, Health Inspection). If a tax receipt is not transferred within 30 days, continuing to do business is subject to the same penalties as doing business without a Business Tax Receipt, as well as payment of the full amount due for each classification. Copy of original tax receipt must be submitted with one of the following completed application packages for the transfer of location to be made to the existing account. Please click on the application below that pertains to your new location address. Except for individual professional and exempt Business Tax Receipts, a Business Tax Receipt may be transferred to a new owner upon application, copy of bill of sale and payment of fee. Any regulatory prerequisites must be met and copies submitted with application by the new owner. Application for Transfer should be made within 30 days. 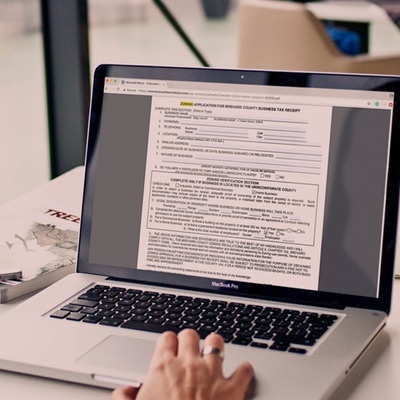 Copy of the original Business Tax Receipt, bill of sale, professional license (if applicable) and current registration of new business and ownership name must be submitted along with application package. Also include the City Business Receipt (if applicable) or if in an unincorporated location of the county, proof of ownership of property or owner authorization. Any individual or business that wishes to conduct or advertise a “Fire Sale” or “Going Out of Business Sale”, or any liquidation sale, (Any sale the public would believe, that upon disposal of all stock of goods on hand, the business will cease and be discontinued) is required by the State of Florida (Florida Statute 559.20) to apply, and purchase a Going Out of Business Permit. Going Out of Business/Fire Sale permits are only issued at the Tax Collector’s Main Office. Included with the application shall be a copy of the proposed advertising, the current county Business Tax Receipt, (if applicable, the city tax receipt) and a copy of the current inventory, listing goods to be sold. The fee required is $50.00. Prior to the issuance of the permit, all tangible personal property and real estate taxes (if applicable) must be paid. 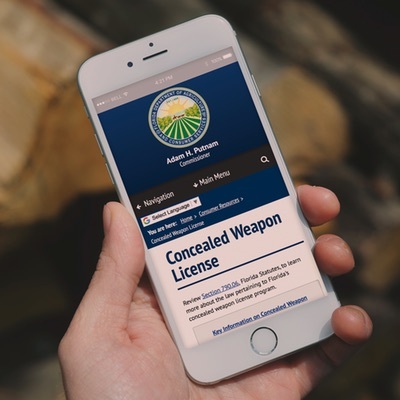 The permit is valid for a period of not more than 60 consecutive days, including Sunday, and any legal holiday, following the issuance thereof. All Business Tax Receipts shall be sold beginning on July 1 of each year; are due and payable on or before September 30 of each year, and expire on September 30 of the succeeding year. If the business location remains the same, but only your mailing address has changed, then the information can be submitted in writing to make the change. Please write the new mailing address on the current Business Tax renewal or receipt along with the wording “Mailing address change only; we have not moved business from the location shown”. Sign, date and return the Business Tax renewal or receipt to our office by mail, fax, email or in person. Online Renewal Instructions: Please review the following information before making an on-line payment! You will need the following items to complete your Business Tax renewal transaction. (Note: Annual business tax renewals are scheduled to be mailed out to businesses about July 1st. If you have not received your tax renewal by the third week in July, please contact us by e-mail: bustax@brevardtc.com and include your name, address, and business tax account number). ATTENTION: If changes are needed on the Business Tax Receipt, an online payment cannot be accepted. Please contact the Tax Collector’s office for further instructions. Credit Card or Debit Card Payments:(NOTICE: A convenience fee of $2.50 or 2.5%, whichever is greater, is added for use of a credit card. A $2.50 fee is added for use of a debit card. These fees go entirely to our third-party vendor). Online Payments can be made with the following credit cards: American Express, Discover Card, Visa or Master Card. Online Payments can be made with the following debit cards: Visa, Master Card. If the total due is $0.00, you must select the Credit Card option at check out. You will not be required to enter your card information. Payments by Electronic Check (E-Check) are accepted only online. Be sure to enter the routing and account number from your check. The routing number is located on the bottom left of your check between colons (:9 numbers:) and is always nine (9) numbers in length. If your banking institution declines payment to the service provider due to an error in your providing the correct routing/account number information, it may be three (3) to five (5) business days before we are notified that your payment was declined. If this occurs, you may be responsible for additional taxes based on the timing of the remittance. DO NOT USE Savings Accounts or Credit Card Checks for E-Check payments. If you are paying by any of the above methods, please click on the Renew Button. By clicking this button, the search screen will appear. You can then choose the criteria you wish to search by. If payment is due, please click the button at the bottom of the record to make your payment.